Born Allen Clayton Hoskins August 9, 1920 - July 26, 1980. 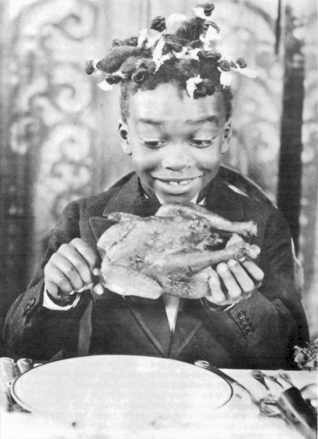 Allen Hoskins was the character of Farina in the Our Gang short films from 1922 to 1931. Farina was cast to be the stereotypical pickaninny in the tradition of the character Topsy from Uncle Tom's Cabin. He appeared in 106 installments of the Our Gang series and later had a successful career as a psychological technician. Allen Clayton Hoskins, aka "Farina" embarked on his screen career at the tender age of fourteen months. 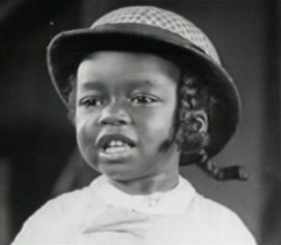 According to studio publicity, Hoskins, was discovered when he was a one-year-old who followed another black Our Gang actor, Sunshine Sammy, into the studio. Hal Roach took one look at the infant and knew he was star material. Hoskins made his Our Gang debut in 1922 and remained with the team until 1931, setting an all-time Our Gang record by appearing in a total of 106 comedies. Moviegoers were intrigued by the Farina character because they couldn't figure out whether he was a boy or a girl. The studio had decided to keep Farina's gender something of a mystery, thinking this would help his career. In the early years, the boy's true gender was disguised by wearing a dress and sporting a feminine cornrow hairstyle with tightly twisted pickaninny pigtails that stood straight up whenever he was frightened. Later he wore old patched gingham clothes, which were to become his trademark. With his husky voice and pleasant way about him, Farina was noted for his common sense and a certain heroic demeanor. Often he came to the rescue of little white damsels in distress. In one episode he attempts to help a little white girl who has fallen into a puddle of mud, only to be accused by the girl's mother of having pushed her in. Farina has the last laugh when the mother herself tumbles into the mud. Farina's character stayed in the series through the silent years and the transition to talking pictures. Farina was portrayed as both a boy and a girl (sometimes both genders in the same film), much to the puzzlement of movie audiences, but over time Allen developed the character in his own special style apart from the standard pickaninny stereotype. He got the name "Farina" from a type of cereal popular during that era. While acting in Our Gang, Farina became one of its most popular characters and later on (in his last contract with the Hal Roach Studios) he was making $250 a week; more than any other child star at that time. 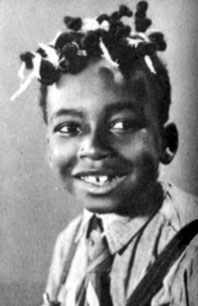 Farina left the Our Gang series in 1931 at the age of eleven and was replaced by Matthew "Stymie" Beard. Afterwards, Allen got some small roles in feature films. He and his sister Jannie Hoskins (also acted in Our Gang), had a vaudeville act. Allen was in the armed forces in World War II and afterwards Hoskins drifted away from performing. Eventually he made a successful career at Los Angeles area medical centers helping disabled young people with drug problems and mental illnesses. Allen "Farina" Hoskins died of cancer on July 26, 1980, several days shy of his 60th birthday.